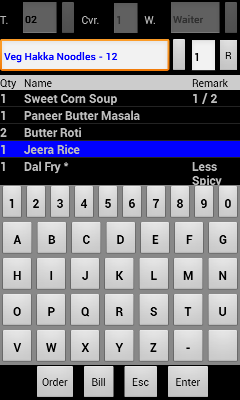 CaptainPadTM Order Entry software is specially designed for restaurant ordering purpose. CaptainPad ordering device increases the table turnover and sale with less staff utilization. 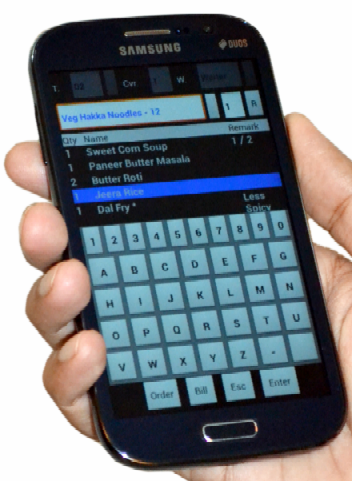 CaptainPadTM Order Entry software works with any Android Mobile/ Tab with 5 inch display and above. Fast Item Finding � Item finding algorithm is 30% faster with minimum key press. Item searching is possible either code vise or alphabetically. Item Remark � Adding special modification remark for item preparation is very easy on CaptainPad device. Smooth Operation � All operations on CaptainPad device are very easy due to its easy to use UI design. Secured Wireless Transactions - CaptainPad Order Entry works on secured wireless WiFi technology. Auto Roaming - Most of the Android mobile supports auto roaming. Lock Android Mobile Device - After installing CaptanPad Order Entry software on Android mobile it locks other mobile features like call/games etc. so that staff can focus on order entry only. Training Mode � CaptainPad has self training mode program inside for understanding CaptainPad order entry Operations for any new person.